Two pairs of stylish mens/womens/unisex reading glasses at a fantastic price! 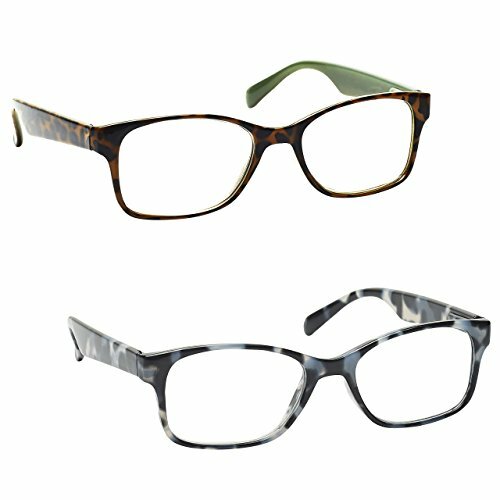 One pair in brown tortoiseshell with mint green inner frame and one pair in grey tortoiseshell with hand finished wrap. For indoors/normal reading conditions. Sturdy frame design with spring hinges. Includes FREE string pull cleaning cloth bag. Optical Power +1.00 (diopter). Two pairs of stylish mens/womens/unisex reading glasses at a fantastic price! One pair in brown tortoiseshell with mint green inner frame and one pair in grey tortoiseshell with hand finished wrap. Sturdy frame design with spring hinges. Includes FREE string pull cleaning cloth bag. If you have any questions about this product by The Reading Glasses Company, contact us by completing and submitting the form below. If you are looking for a specif part number, please include it with your message.